Anitha was a widow with a five year-old son when she joined the Dhana Lakshmi SHG. She led a very lonely and sad life and had no self-confidence. She was totally dependent on her husband’s family. 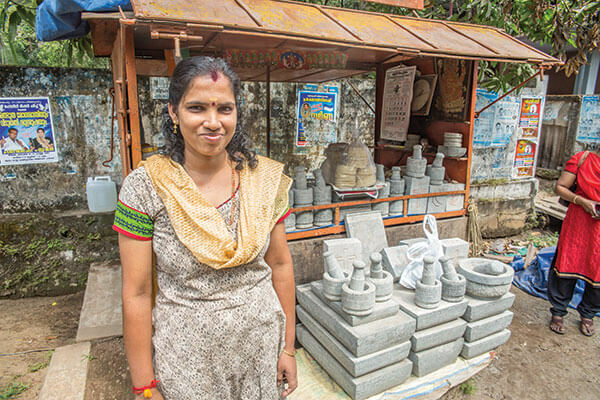 With a loan from the Nirkunnam AmritaSREE cluster, she built a house and started living in her own home. This sentiment is echoed by many other women. Before they joined an SHG, they were alone to meet their own needs, whereas now they are able to not only fulfill their own family’s needs, but they can also reach out to others. And the more they reach out, the more confident they feel confident to help themselves and others. In 2012, the coastal SHGs of Alappuzha district, that is nearly 4,600 SHGs, registered as a society. Initially, Beenamma, the coordinator of Nirkunnam cluster, had reached out to women by calling them, whereas today people call her. The shy housewives of yesterday, while still fulfilling their household duties, now have the confidence to approach bankers, manage accounting records, and speak in public.